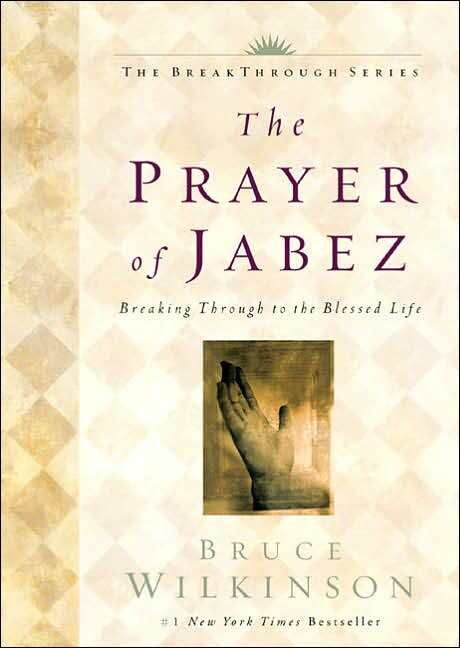 I started reading The Prayer of Jabez by Bruce Wilkerson the other day. I have to admit that I tend to shy away from reading or doing things that have gone through a “fad phase”. Sometimes it seems like things get too popular and everyone does something simply because they want to be part of the fad. However, it has been some time since the prayer of Jabez fad and my mom gave me the book and recently suggested again that I read it, so I am. I am nearly done with it already because it isn’t long. I think I only have one chapter left. My opinion on the book is this: it’s a great prayer and a good practice to pray it. I am enjoying reading the book and praying the prayer. However, I recently preached on the Lord’s Prayer and have been praying that since then. The prayer of Jabez is essentially the same except that it is shorter than the Lord’s Prayer. I think I prefer the Lord’s Prayer actually. It is more focused on God working through you than on God blessing you. God blessing you is a fine thing to pray as illustrated by Bruce Wilkinson’s book, but I think that we all need to focus more on God and stop focusing on ourselves. I think the Lord’s Prayer does a better job of helping me do that. You be the judge for yourself. Try out both. The essential thing for all of us is to seek God and His help and guidance in our lives. We need to be His workforce on Earth.